Kickerinho goes in for the goal, but comes up with a yellow card. This year, the World Cup was held in Brazil. The United States had a good showing and morale was high during its run that ultimately fell short. That said, Kickerinho tries to jump on the soccer hype with a simple skills challenge. 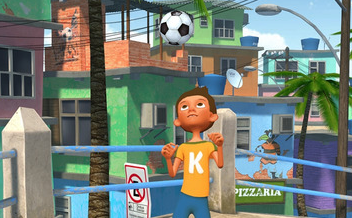 In Kickerinho, you control a young boy named Kickerinho as he practices soccer dribbling. It's a one-touch tap game, where you press left or right on the screen depending on which side the ball travels. Kickerinho starts out by kicking the ball, but the timing of the kick effects what move he does next. If you kick the ball high, he might practice his headers or balance it on his back. The game is simple to play, but difficult to master because of all the different moves. The goal is to get a high score, and you can save your performance and upload it to social media, an awesome feature to show off a good run. The sudden switch in moves inevitably screws up your timing and performance. You start off kicking the ball, and then out of nowhere you will start practicing headers or balancing the ball on your back. You can't control how hard you hit the ball, so the switch in moves is completely random. Sometimes you can hit the ball on the side it's on and it will just bounce off your leg or head, even though you struck it correctly. Kickerinho is a good idea that was poorly executed. It looks nice graphically, but the gameplay fails to measure up. Leave it alone and go for one of the better tap-to-win games. Download Kickerinho for iPhone, iPad and Android.